Me and My Thoughts: Love You More! 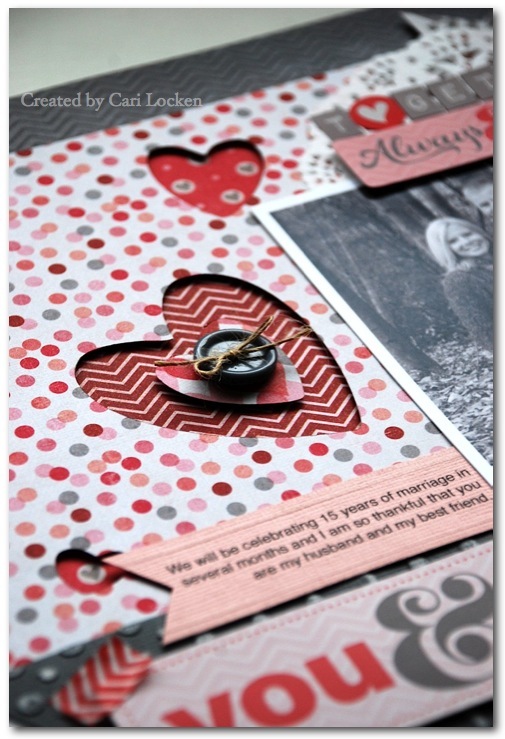 Have you seen the new Imaginisce collection called Love You More?? Oh my! It is my new fav! 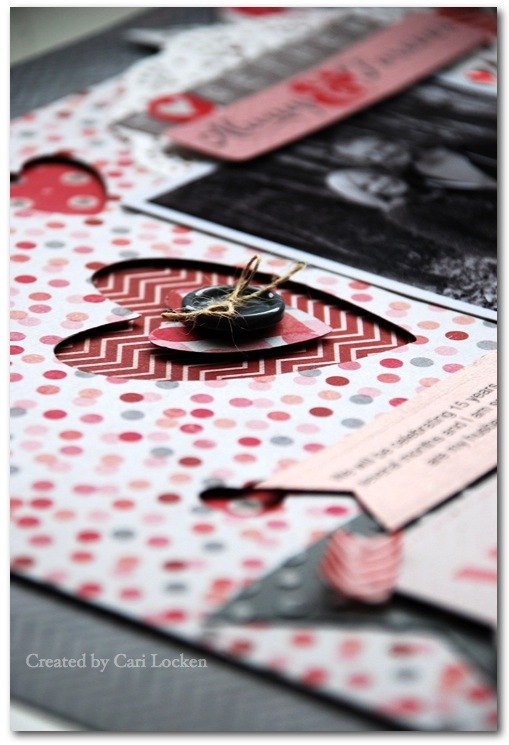 Here's a layout that I created using this new amazing collection. I chose the chevron gray patterned paper to use as my background because I knew that I wanted to use a black & white photo. To balance the B&W photo with the background paper I used the more colorful & playful designs & colors to brighten things up. I also used my Cricut Expression to cut out the heart designs on the spotted paper. I traced the heart shapes onto the gray paper and then placed small scraps of different patterned papers. 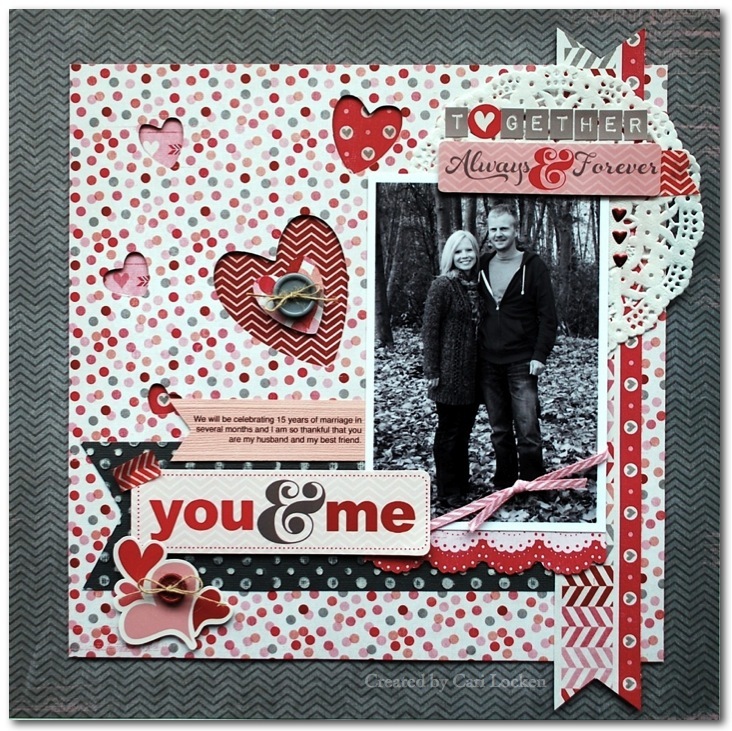 I adhered the spotted paper (with the cut out heart shapes) using some foam tape. This gave a bit of dimension which I love. 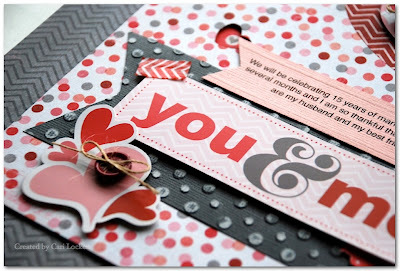 I embossed some Core'dinations cardstock in gray to give a bit more depth with the darker color and then adhered the sticker "you & me" (using foam tape) overtop along with the heart sticker at the bottom left (again using more foam tape). I added a few heart shape Glam Rocks to give some shine & bling to my layout. Plus they fit perfectly with the theme! And the small square alphabets worked wonderfully with the sticker "always & forever". Thanks for stopping by and I hope I've inspired you with this fabulous collection. You should be able to find it in the stores already!! 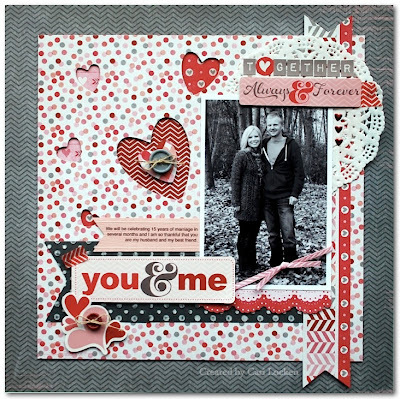 beautiful layout, love the grey backdrop with all the layered reds. its wonderful how you created more dimension on your lo, very well done. thank you forsharing. What a gorgeous layout! 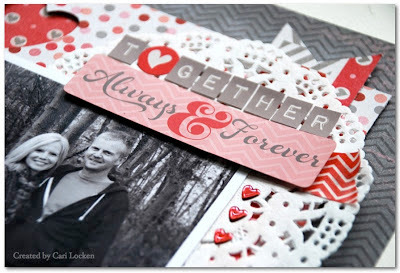 Love that you used so many different papers! goes great together with the b/w photo!